So in this post, I want to talk about the issue of aging and how to maintain hope about engaging in a creative endeavor. It is so easy to think it is just too late. But while it might be too late to become a ballerina, it might not be too late to enjoy seeing others dance. He also said “I have heard I am the oldest person to win this award. I hope that that record is broken quickly and often”. I hope so too. And not just for the big fancy accolades like his but for accolades of any kind. It could be as simple as someone at 90 years of age in a nursing home taking a painting class . So what do I mean by being mindful? 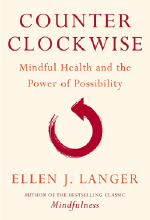 In an extremely upbeat book written by Ellen Langer, entitled :”Counter Clockwise, Mindful Health and the Power of Possibility,” she describes it like this, “It is about the need to free ourselves from constricting mindsets and the limits they place on our health and well-being, and to appreciate the importance of becoming the guardians of our own health.” I’d like to suggest that this same belief can be applied to one’s relationship to their creativity. You are currently browsing the The Intuitive Edge blog archives for July, 2011.